Your budget dashboard is your command center for tracking your progress throughout your budget period. Use the Year, Month, and Period selection area at the top of the Budget dashboard to navigate between past, current, and future budget periods. New budget periods are created for you automatically when the new period starts and will be available here based on the budget configuration settings you’ve chosen for a given budget interval (e.g. a new weekly budget starting on Sunday will automatically become available via these drop downs every Sunday). The information dashboard displayed at the top of your Budget sheet gives you a high level view of how you’re doing. Your budget will be the most accurate if you stay on top of categorizing your transactions. If there are new transactions waiting to be categorized you’ll see an alert that indicates how many are waiting. If you’re current with your categorizing you’ll see this indicated as well. If you notice that the display indicates there aren’t any to categorize, but you’re expecting some, visit your Tiller Console to trigger a refresh. These four bars represent your actuals (left) against your budgeted amount (right) for income and expenses. A) The amount of expense budget you have remaining, the percentage of your total expense budget it represents, and the amount of time left in the current period. B) The amount of money that’s available to allocate from your expected income budget. If you’re a zero budgeter, you want to see a big green check mark here. This is essentially, also your planned cashflow. C) The total amount of rollover (savings) money that you have across all your categories, including how your Rollover Adjustment factors into this amount. D) The amount of money represented by your transfers and the total number of transfers this period. Ideally, you probably want this to be $0. Read more about transfers. 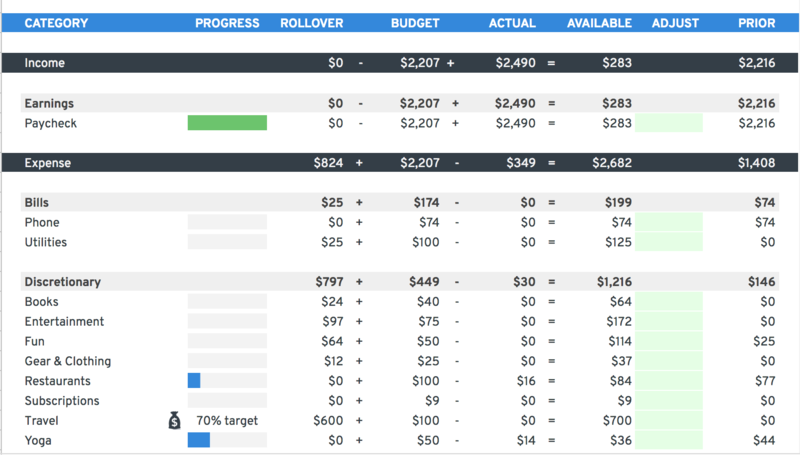 The Budget Detail area is where you track your progress for each budget category throughout the period. Your non-hidden categories are displayed here and organized by type, Income and then Expense, and then by group within each type. The name of your category. Make changes to this on the Categories sheet. A sparkline depicting your actuals against your budget or your % progress toward a savings goal. The amount of money from the available column that was rolled over from a previous period into this period for this category. Click here to learn more about rollover budgeting. The amount you’ve budgeted for this category for this period. The amount you’ve actually spent or earned for this category for this period. The sum of the budgeted and rollover minus the actuals for this period for expenses. The sum of budgeted and actual minus the rollover for income. An editable cell for adjusting budget amounts or rollovers. Read more on how to use this cell. The amount of actual spending or earnings for the category from the prior period.